This 23 year old man presented with a sore throat, difficulty swallowing, a temperature of 38.0 C , a heart rate of 115 beats per minute and a systolic blood pressure of 90 mm Hg. Examination of his throat revealed enlarged and inflamed tonsils covered with patches of white exudate, similar to the image in Figure 1. The cervical nodes were enlarged and tender. A diagnosis of acute (streptococcal) tonsillitis was made. A screening test for infectious mononucleosis was negative. Treatment was begun with aspirin, intravenous fluids and penicillin, and the patient was admitted to the Emergency Department Short Stay Unit. Figure 1. Image of acute tonsillitis (not from this case) with changes similar to those present in this patient. An electrocardiograph (ECG) was done because of the tachycardia and hypotension (Figure 2). The patient had no past history of cardiac disease or palpitations. The ECG shows a sinus tachycardia with a ventricular rate of about 111 beats per minute. Delta waves and a short PR interval are seen in multiple leads (Leads I, aVL, and Leads V3 to V6), consistent with ventricular pre-excitation (VPE) via an atrioventricular accessory pathway (AP). There is no past history of arrhythmias or syncopal episodes, so this (asymptomatic to date) ECG abnormality should be called VPE and not Wolf Parkinson White (WPW) syndrome. The R-s-R' shape of the QRS complexesin Lead V1 and Lead V2 resemble those seen in right bundle branch block, and the QRS morphology in Lead V1 has a passing resemblance to the ECG changes seen in Brugada syndrome. A second ECG recorded about two and a half hours after the initial ECG is shown in Figure 3. Figure 3. ECG taken at 2026. The heart rate is 85 beats per minute, the ECG features of VPE persist (although the QRS complexes in the inferior leads are narrower), and sinus arrhythmia is seen in the rhythm strip. The final ECG recorded about eight hours after the initial ECG is shown in Figure 4. 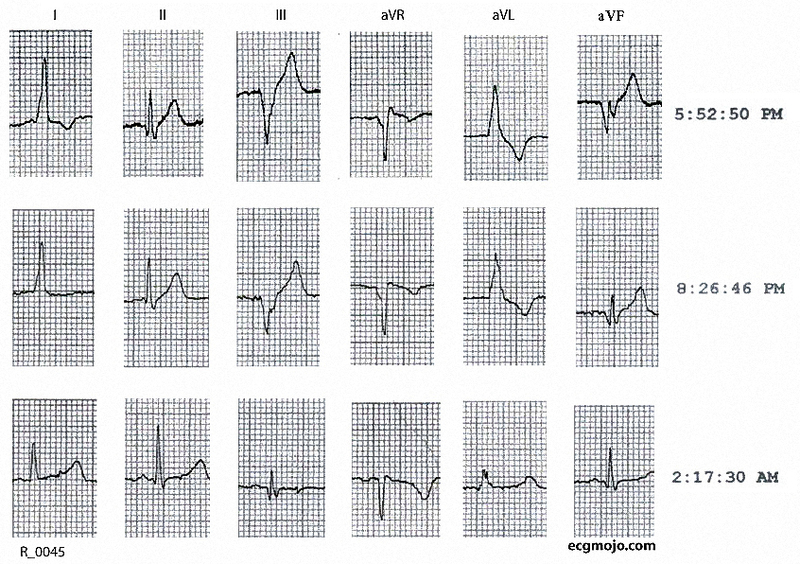 The ventricular rate is about 47 beats per minute and the ECG features of VPE are less marked. A comparison of the serial changes in the frontal leads is shown in Figure 5, and the serial changes in the precordial leads are shown in Figure 6. 1. 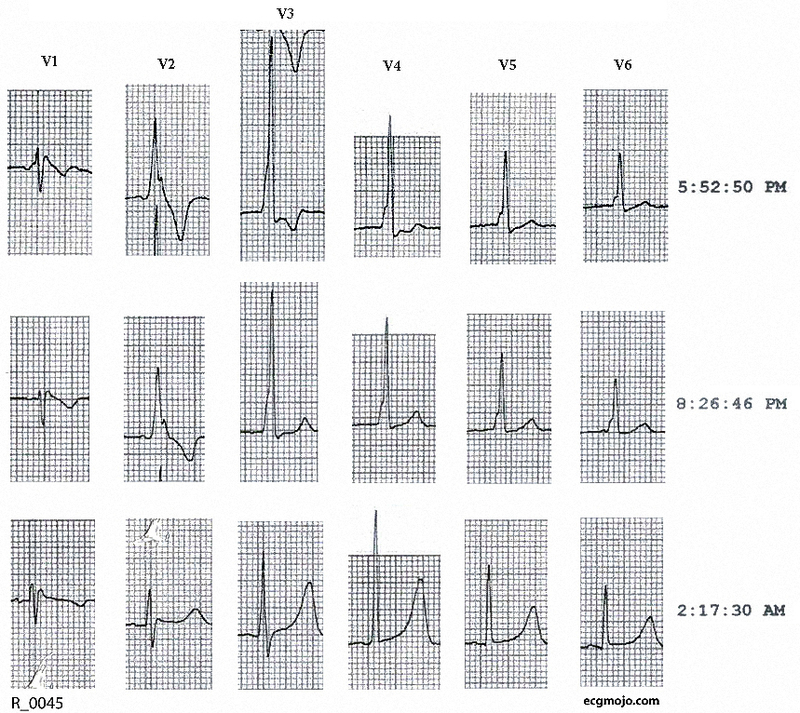 The initial 12 lead ECG shows the incidental finding of Pre-excitation Syndrome (PES). Normally the only conduction pathway between the atria and the ventricles is the atrioventricular node (AVN) and the bundle of His. Some people have an extra piece of heart muscle tissue that directly connects the atria and the ventricles, bypassing the AVN altogether. This bypass tract or an accessory pathway (AP) allows electrical signals to travel between the atria and ventricles (from the atria to ventricle [atrio-ventricular] or from the ventricle to atrium [ventriculo-atrial] or in either direction). The conduction of an electrical impulses through the AP is faster than conduction through the AVN. If the AP only allows ventriculo-atrial conduction then the patient's ECG will have a normal configuration at rest or during tachycardias. If the AP allows atrio-ventricular conduction the ECG will usually be the result of "fusion" of (depolarisation) changes due to AP conduction and those caused by (normal) conduction through the AVN. These usually produce visible(and typical) ECG changes of PES i.e a short PR interval and a delta wave. The ECG changes of PES can be intermittent or (as in this case) more marked at faster heart rates. The lifetime risk of mortality related to this in asymptomatic individuals has been estimated to be in the range of 1 per 1000 (0.1 percent annual risk). The majority of sudden death patients werebetween the ages of 10 to 40 years. About one in three persons in long term studies will develop supraventricular tachy-arrhythmias (usually supraventricular tachycardia, although a few will experience atrial fibrillation). A non invasive indicator of low risk in a person with incidental PES is the sudden disappearance of pre-excitation during exercise. The observation that PES was more marked at a faster heart rate in this case is interesting, buton its own does not have any prognostic significance. 3. There are case reports of patients with co-existent Brugada syndrome and PES. An example of such a case is shown in Figure 7. Leads V1 to V3 in the first ECG of this case are superficially similar, but these changes become less marked as the heart rate slows. Figure 10. Acute rheumatic fever with acute aortic incompetence and acute mitral incompetence due to rupture of the chordae tendineae. A: Chest Xray shows cardiomegaly and extensive alveolar infiltrates; B: Chest Xray after intubation. An ECHO study showed aortic valve incompetence and mitral vale incompetence; C: Chest Xray after replacement of the aortic valve and the mitral valve. Choby BA. Diagnosis and treatment of streptococcal pharyngitis Am Fam Physician. 2009 79:383-390. Anderson Y, Wilson N, Nicholson R, Finucane K. Fulminant mitral regurgitation due to ruptured chordae tendinae in acute rheumatic fever. J Paediatr Child Health. 2008; 44):134-137. Klein GJ, Gula LJ, Krahn AD, Skanes AC, Yee R. WPW pattern in the asymptomatic individual. Has anything changed? Circ Arrhythmia Electrophysiol. 2009;2:97-99.